The Park Bistro and Bar will be closed for renovation beginning Monday February 18th 2019 and will reopen for dinner on Friday March 1 2019. During this time we will have limited service in the Library for breakfast and dinner. Due to limited seating we are unable to accept reservations during these dates. Seating will be available on a first come first served basis. In Room Dining will be available during the renovation. 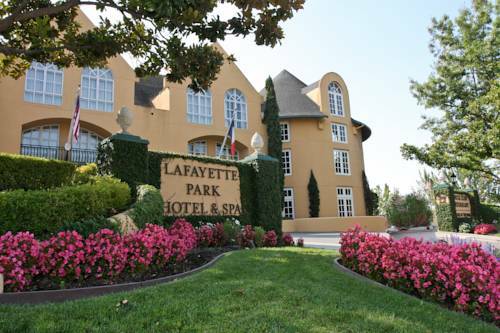 Nestled amongst the rolling hills of the San Francisco East Bay the Lafayette Park Hotel and Spa combines French Chateau architecture with modern amenities to create the perfect environment to enjoy an elegant social event a relaxing retreat or conduct professional business. The Lafayette Park Hotels central location makes it convenient and easy to get to the business centers of Walnut Creek Oakland Berkeley Pleasant Hill Concord Pleasanton San Ramon Orinda Moraga and beyond. San Francisco is 30 minutes away by public transportation or private car. A broad range of activities are easily accessed via the hotels complimentary shuttle within a three mile radius and via BART public transportation that goes to San Francisco and throughout the Bay Area. Near the hotel you can enjoy the shops of Broadway Plaza in Walnut Creek events at the Oracle Arena Oakland Coliseum and the Sleep Train Pavilion in Concord. Within a half hour drive you can find yourself enjoying the sights of downtown San Francisco and within an one hour drive you will be in the wine country of Napa Valley and Sonoma. With our beautiful poolside setting and full menu of signature massages facials and body treatments come experience why locals consider The Spa at the Park as the best day spa in the San Francisco East Bay. Our goal is to provide the most beneficial treatments and products in a soothing atmosphere where our professional staff will cater to your comfort and well-being. Thomas Jefferson Room: Meeting room located on the 2nd floor with executive boardroom table. Conference Suite 209: Conference guestroom suite located on the 2nd floor with executive conference table. Conference 222: Conference guestroom suite located on the 2nd floor with executive conference table. The Lafayette Park Hotel central location makes it convenient and easy to get to the business centers of Walnut Creek Oakland Berkeley Pleasant Hill Concord Pleasanton San Ramon Orinda and Moraga. San Francisco is 30 minutes away by public transportation or private car.